The $2 million renovation of the Billy Webb Elks Lodge is complete, and festivities marking the achievement are Tuesday, June 23, from 3 - 7 p.m. at the lodge, 6 North Tillamook St. The public is invited to a walkthrough of the completed facility, and to enjoy a wine and cheese tasting catered by Pans Pots and Skillets, with valet parking and music. 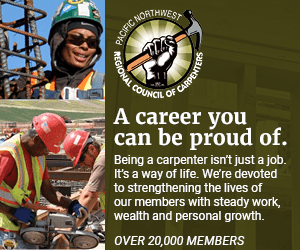 Members of The National Association of Minority Contractors of Oregon, which spearheaded the renovation, say they hope attendees at the event "who build, remodel, and develop seek the work of members and consider using the members of NAMCO so that we can continue to reinvest in our community." "I think the main reason we did it is the history of the building, and being able to show that NAMCO is contributing to the local community," said Maurice Rahming, the group's newly-elected president. Wanda Broadous, of Broadous Entertainment, was a key player in the fundraising efforts for the building's renovation. Before a single window was repaired or shingle replaced, Broadous helped to organize dances, fashion shows, live music and other events to raise money and awareness for the Lodge. Broadous has said she wanted to make the Elks Lodge a part of the future instead of something spoken of "once upon a time." After the last show was complete, Broadous collapsed. "Wanda put so much work into the cause that on the day of the last show, she wound up in the hospital in cardiac arrest," Brenda Gersch, Broadous' secretary. "She just about gave her life for the Elks." Organizers say the lodge project featured an array of green building trends, including installation of energy efficient furnaces. Old materials removed from the building were recycled where possible or given to community residents, participants said. All the labor was donated and total cash raised to supplement the materials was $135,000. Built in the early 1900's, the historic Elks Lodge has served as a YWCA; then a USO Club for African American soldiers and their families where Black musicians could showcase their music; and a safe haven for those fleeing the Vanport floods in the 1940s. Over the years the lodge has been used for wedding receptions, special events and large gatherings. NAMCO organizer James Posey says the Billy Webb Elks Lodge is one of the few remaining African American-owned buildings managed by its membership. He says the facility is available for yoga or floor exercises, meetings, retreats, community activities and more. Aside from the building itself, NAMCO members say they've pulled together a long-range business plan for the building's operation so that the group can achieve its goals of purchasing commercial appliances and opening up for lunch and catering events in the future. You may also reserve the facility for your upcoming activities by placing a small deposit at the event.